ISLANDIA, NY--(Marketwired - Mar 24, 2014) - Once upon a time, scarlet was a color with dubious implications for women. But nowadays the American Heart Association has reclaimed the hue as a symbol for empowering women to take charge of their health and decrease their risk for heart disease. Nothing drives this message home more dramatically than Go Red for Women, a nationwide movement that recently touched the collective heart of the Islandia Marriott Long Island. Designed to raise awareness of the No. 1 killer of women, Go Red for Women is part of the American Heart Association's multifaceted approach to fighting heart disease. The most recognized of these efforts is National Wear Red Day when crimson drapes across everything from individuals to buildings in solidarity with the good cause. 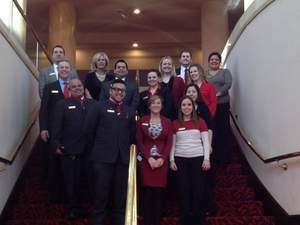 This year, Wear Red Day happened on February 7, and chief among its participants was this hotel in Hauppauge, Long Island. Staff members in every capacity gladly joined together that day. After donating generously to the American Heart Association, everyone from the front desk to the back offices sported a little scarlet in honor of the day. Considering the hotel's reputation for being one of the most attractive event venues in Long Island, celebrating in big way is de rigueur for the staff. The hotel's 14 function rooms offer 12,032 square feet of Long Island meeting space equipped with state-of-the-art A/V capabilities and premium business amenities. On-site event managers can also transform that same space into spectacular wedding receptions with customized menus and décor. Located just minutes away from the Long Island MacArthur Airport, the property is also among the most comfortable and convenient beach hotels in Long Island. Guests can capitalize on its ideal situation to visit Jones Beach, Stony Brook University and a variety of attractions while enjoying the hotel's well-appointed guest rooms. From Going Red to going on vacation, this is one premier destination that knows how to make a positive impact in everything it does. A warm welcome awaits visitors at the Islandia Marriott Long Island. With an airy, light-infused atrium offering a dramatic first impression, the hotel invites guests to experience the comfort of its 278 guest rooms and 13 suites. There, visitors enjoy wireless, high-speed Internet access along with movable desks, flat-screen televisions, in-room movies, plush bedding and in-room coffee/tea service. A concierge level offers additional luxury for those looking to enhance their visit. Two dining options -- Bistro Five-Eight (serving American cuisine) and Atrium Bar (offering cocktails and light dinner) -- cater to a variety of travelers. So too do the indoor pool and fitness center, which provide welcome breaks for everyone, especially business guests attending expertly coordinated meetings within the more than 12,000 square feet of event space. And with a variety of attractions like the beach, amusement parks and The Hamptons nearby, there are plenty of reasons to stay a little longer. Islandia Marriott Long Island joined the "Go Red for Women" movement on February 7, 2014, to help support the fight against heart disease.